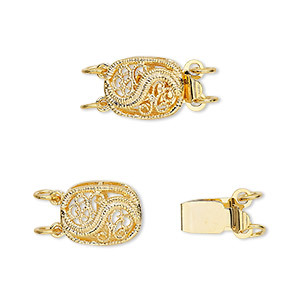 Clasp, tab, gold-plated brass, 12x9mm filigree oval. Sold per pkg of 4. Item Number: H20-4291FD Have a question about this item? Easy to use! 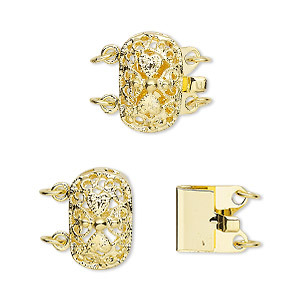 Clasp opens with one touch push bottom backing. Extremely secure and long wearing. Useful styles for bracelets and necklaces. 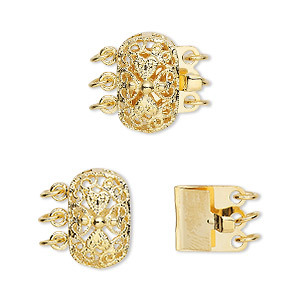 Brass base metal with bright gold electro-plating. 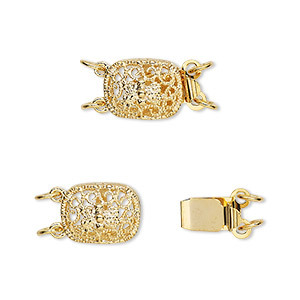 Clasp, 2-strand tab, gold-plated brass, 12x9mm filigree oval. Sold per pkg of 4. 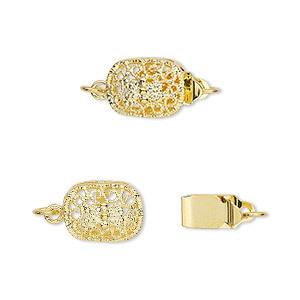 Clasp, 3-strand tab, gold-plated brass, 12x9mm filigree oval. Sold per pkg of 4. 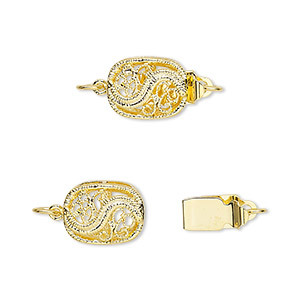 Clasp, 3-strand tab, gold-plated brass, 15x9mm filigree oval. Sold per pkg of 4. 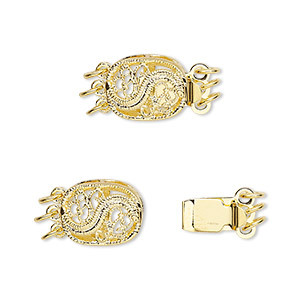 Clasp, 2-strand tab, gold-plated brass, 15x9mm filigree oval. Sold per pkg of 4. 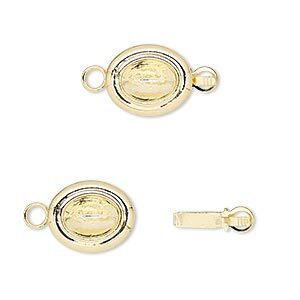 Clasp, Almost Instant Jewelry®, tab, gold-plated brass, 13x11mm oval with 8x6mm oval setting. Sold per pkg of 4. Clasp, tab, silver-plated brass, 12x9mm filigree "S" design oval. Sold per pkg of 4. 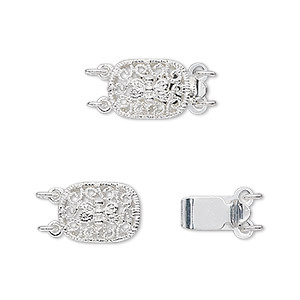 Clasp, tab, silver-plated brass, 12x9mm filigree oval. Sold per pkg of 4. Clasp, 2-strand tab, silver-plated brass, 12x9mm filigree oval. Sold per pkg of 4.